The mobile-payment market has been evolving rapidly. With the ubiquity of credit cards, customers are less likely to carry cash. Near Field Communication systems, popular in Asia, are also advancing, and services such as Google Wallet (not out in the United States yet) will make it even easier for customers to pay without cash. Setting up merchant services with your bank can be complicated, with lots of hidden fees; but when it comes to accepting a credit card payment directly on your smartphone, you have more options these days. Two of those options, Square and Intuit GoPayment, will send you a small credit card scanner for free when you sign up for a new account. Each scanner simply plugs into your smartphone’s audio jack. Intuit's GoPayment system surfaced in the news recently, as Verizon started offering its mobile credit card scanner in retail stores. Verizon will charge you $29.97 up front for the scanner, but then give you a $30 mail-in rebate--which is odd, considering that Intuit will send you one for free when you make a new account. Each service offers apps for iOS (iPhone, iPod Touch, and iPad) as well as for Android. Intuit’s GoPayment also supports some BlackBerry phones. Since the devices plug into the headphone port, they are compatible with almost any phone that can run the app. Each service is easy to set up and has a simple fixed-percentage fee with no separate transaction fee. I’ve been testing both tools in my own business as a freelance musician and private violin teacher for a few weeks now, and in this article I'll outline my findings. Square's reader is small but sturdy, about the size of a quarter. The tiny size of the reader makes it more difficult to hold steady while swiping. I also wasted valuable time running and rerunning a worn-out card while a student waited for his lesson to start. For some of the cards I tested, reading often took several swipes; the worn card never did scan, and I had to enter the number manually. The compactness of the Square Card Reader also makes it harder to keep track of. You can attach a lanyard or key ring to the device, but it doesn’t come with one. I've been keeping my reader in the foam holder it shipped in, so that it doesn’t get lost in my bag. The Intuit GoPayment reader is larger and has a much longer slot for swiping a card. It comes in a plastic case with a lanyard already attached. It also offers less resistance, so cards glide through. I had more success getting it to read cards in fewer tries. This Mophie case for iPhone has a built-in scanner that works with Intuit's GoPayment app. Intuit's list of supported hardware is much shorter than Square's, however, and doesn't include my phone, a Motorola Atrix running Android. In my tests the app recognized the scanner, but failed to read any data coming in. The only way for me to use the GoPayment app on my phone would be to key in the numbers manually, which takes longer and comes with a higher fee. The scanner worked well with my iPad. 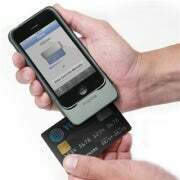 Square offers only the small audio-jack scanner, but with the GoPayment system you have more options. For $219, Intuit sells a desktop scanner that connects over Bluetooth and includes a built-in printer for receipts. I also tested a Mophie case for iPhone 3G with a built-in scanner ($80). The Mophie case gave me the most reliable scans, better than either audio-jack reader did. Signing up for the Square reader was fast and easy. The company requires only an email address and a password, and a mailing address for sending the reader. I was able to take payments right away, and I didn’t need to submit my bank information until I was ready to start pulling money out. After verifying your bank account, Square automatically deposits transactions each evening. The Intuit setup required much more information up front--including bank account details and credit report questions. Even with all of that, my account was approved within a few hours, and the card reader was in the mail the next day. Setup with both devices is as simple as installing the appropriate app from the marketplace and plugging the scanner into the headphone port. However, you will have to go into the GoPayment settings and tell it whether you’re using the audio-jack scanner or a Bluetooth scanner--and turn up the volume. The GoPayment system is great on its own or added into an existing Quickbooks based accounting structure. The higher volume rate plans are the best on the market. Just make sure you have a supported smartphone or tablet, as hardware support is more limited.